Multitasking is just like regular-tasking nowadays! We requested Marta to take photos of our engagement last minute and there was no hesitation to jump to the request. Communication was easy and pictures turned out great. Marta surpassed any of our expectations and was an incredible photographer at our wedding. She made us feel comfortable and at ease, and had so many fantastic ideas for capturing a variety of shots of our wedding. We had a hard time picking favorites! Marta was professional, punctual, easy-going, and creative. We highly recommend booking her for your special event; you will be NOT be disappointed! Marta has been a pleasure to work with. Her photos really capture the spirit of the day. We've got many awesome photos to choose from. 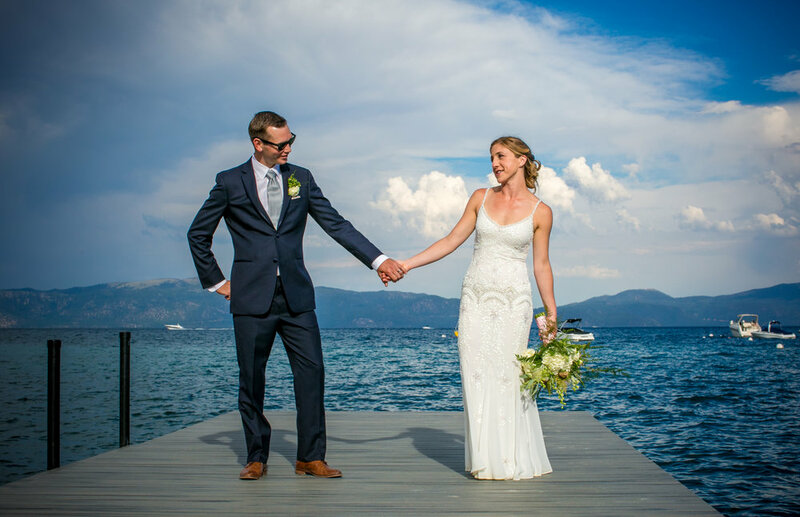 My son had a wedding at Granlibakken, Lake Tahoe. Marta suggested a quick drive to the lake to take some shots too, I'm so glad she did, those came out really nice! Marta was awesome! She has a great eye and gets creative with the photos. She makes sure everyone is looking good by posing people and she also took great candid shots. She was so fun to work with. Ours was a small wedding, in a quiet venue--far from the amazing landscapes of Tahoe and the High Sierras. But what Marta captured was nothing short of the miraculous. She truly has a gift for lighting and composition that I couldn't really appreciate until after the wedding. Our venue and schedule of events were admittedly limiting and challenging. But what Marta was able to do with the space, the lighting and the group was truly astonishing. She was on time and present at all the important events during the evening. She was communicative, fun and very flexible. She worked within our schedules and budget. Everyone from the Grandmas to the wedding planner absolutely loved her! (And loved her even more after we received the photos and saw what she had captured.) We received pictures within a day or so of the event--while visiting relatives were still in town and we could share the pictures with them (No immediate honeymoon for us). Within a few short weeks, we received the entire shoot--hundreds and hundreds of photos--all of which are uniquely beautiful and capture the joy of the evening. Marta captured moments and perspectives that no one had witnesses and we were surprised when we saw the photos. Marta even went the extra step to edit certain photos to accentuate the special moments by adjusting colors and/or lighting. She is a true artist. We heartily and without reservation recommend Marta and High Sierra Photos! Marta was such a pleasure to work with, an absolute professional - and I would highly recommend her. My wife and I were so pleased with everything about the day, most of all how wonderful our pictures turned out. 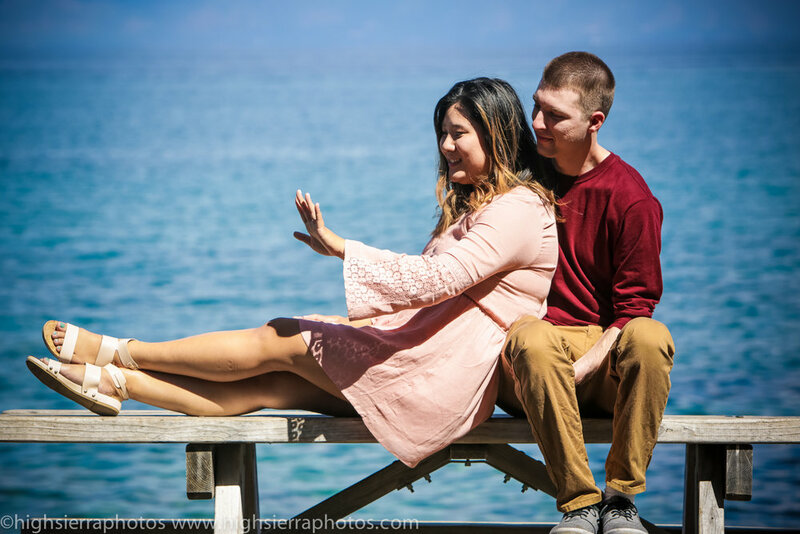 After our initial consultation she was more than accommodating as our plans for the day evolved, helping us to find a second shooter, a videographer, and had suggestions for a variety of vendors in the Lake Tahoe area. On our wedding day Marta had the perfect combination of a laid-back attitude while being assertive when needed, making sure that we had all of the shots we requested, but without making the day stressful. And afterwards, she provided us with all of the final photos quickly and in a variety of formats ready to go - One of the photos even won an award in a bridal magazine! If Marta is available for your wedding, book her immediately! Marta was so amazing! She made the process fun and enjoyable, was easy to work with, very accommodating, and the final product turned out spectacular. She does a good job of making everyone feel comfortable on camera. We couldn't be happier with our choice of photographer. Everyone was very impressed, the quality was top-notch, and the turn-around was lightning fast. Having worked for the Yosemite Conservancy for many years, she really had all the experience in photographing in Yosemite. She really knows how to capture the right balance between action shots and scenery. She has a way of capturing the right moments/authenticity in people. Overall, we were delighted with Marta of High Sierra Photos! Marta was amazing. She was so nice and professional and made everyone feel so comfortable. We had a huge wedding party of 18 people but she was easily able to give everyone direction and get our group pictures done in the short time frame we had between festivities. She took her time photographing me and my husband and we had an absolute blast getting to know her. We took some very unique pictures jumping on a trampoline that we loved. She captured the excitement and emotions of our favorite day perfectly through her camera. We highly highly recommend her to anyone looking for an amazing professional photographer! We will definitely be using her in the future for any other events we may have! Marta is absolutely the BEST. She makes you feel so comfortable and confident during your shoot! We highly recommend booking her because he is more than a photographer, she becomes a friend. We love our photos! Marta was amazing! I proposed to my Fiancé on Eagle Rock in Lake Tahoe on Labor Day weekend. Marta went above and beyond! I asked her to pose as a tourist, so she hiked up to Eagle Rock and scoped out the area, well before the planned date, and sent me pictures of where I should stand for the best shots and angles! Who does that!?!? Marta was very professional, on time, and happy to be there. It was a very special moment, and she captured everything we could have wanted. It was a wonderful experience, and if we have our wedding anywhere near her, we know who to call! Thanks Marta! We absolutely LOVED working with Marta! Not only is her work amazing, she is an amazing person to work with. She captured so many beautiful pictures of my husband and I, along with our family/ friends drinking, laughing and celebrating. She made us feel at ease taking the traditional pictures as well. The pictures came out above and beyond our expectations. Marta is a genuinely lovely and fun person which makes the whole experience that much better. Besides our wedding celebration photos we also had our son baptized the following day, and I can't say enough how wonderful it was to have her capture those precious moments. She truly is so easy to work with and made the whole experience fun and tailored it to our personality. Highly recommended! Marta was very professional. She was on-time at the day of the wedding. She was very flexible when I requested if she can come early. She was very knowledgeable. I will definitely hire her again on my next event. Marta did our wedding in Yosemite, and we couldn't be happier with the results. She was very professional, and her knowledge of the area got us some unique, amazing photos. She seemed to genuinely be enjoying herself, which made taking photos fun versus the chore I had expected it to be. She's a great find, and I absolutely recommend her for any event you may have. "Marta Czajkowska is such a pleasure to work with. She's one of those rare photographers who can really bring out personality in her subjects and totally capture the moment and make you feel great at the same time!" "Marta is totally in tune with nature and her photos undoubtedly reflect that. The way she makes use of natural light, and how she find patterns, colors, etc.to 'embed' the model(s) is fascinating. She is very creative and passionate about her work and creates a casual environment that makes you feel comfortable. All of the photo shoots we had were full of laughter -- and the results are amazing!" "I've used Marta's photography services three times. Every session was shot on location and Marta handled the varying conditions (weather changes, situational intensity, etc.) with the ease of a true professional. She got some really great shots while keeping us relaxed and upbeat. She's got amazing vision that comes through in her photos and artwork. When it's worth the trouble of getting a professional photographer, it's really worth knowing you're in the right hands. Thank you, Marta!" "Marta makes one feel at ease and brings out the very best features in a natural way. She created some pictures for my business card and website in Honolulu, Hi. I loved the one hour photo shoot with her, she is funny, intuitive and a true professional. Time passed by very quickly, she kept me engaged and we laughed a lot. The resulting pictures are amazing, they express me beautifully without being contrived. Thank you Marta!" "Marta came to our family reunion/birthday party and took a group photo of about 60 people with about 20 of them children under 13 years old. Four were infants. She did a great job lining everyone up. After main shoot she allowed family groups to pose for pictures, siblings and friends. Lots of pictures to choose from made a lot of people happy. I love that I can take my time and decide what I want and order prints from anywhere there is good value. Marta also sent them in a large format for having prints made and a smaller format for emailing. I am very happy with results and highly recommend her services." "Marta is very professional as an artist, photographer and creative director. With sharp focus, wit and a warm heart, she makes it very fun to work with her while producing what you want at a very high level. She turns work into an adventure and an experience." "My experience modeling for Marta was awesome! We were in Hawaii, Marta drove and we hiked up to a beautiful location. Her awareness of my comfort and ease made for a very enjoyable experience. She offered helpful direction and suggested poses that took in consideration of wind and lighting. After the shoot, I received the images in a very reasonable amount of time. They are some of the most beautiful images I have of myself. Her eye is well trained and she is a very talented photographer. I look forward to the opportunity of working with her again!!!" "Marta consistently takes the best photos ever taken of me. In our photo shoots she makes me feel completely at ease with her sense of humor and encouragement. She's also creative and great at action shots." "I did not just book a photographer, I booked an experience. Marta is not only a talented photographer but a bit of a comedian too. I felt comfortable during our session and my pictures truly reflected the essence of my event. The pictures also captured the excitement of my clients and tell an accurate story of the event! Priceless!!!! I am booking her again for my next event! Crossing my fingers that she is available!!!!" "Marta approached a challenging shoot involving multiple children with warmth and good humor. I was impressed with her ability to frame beautiful shots with perfect natural lighting while wrangling kids and coaxing smiles out of cranky toddlers. The quality of her work is outstanding!"